To commemorate the World No Tobacco Day, Citizens Awareness Group, a local NGO in collaboration with Consumer VOICE, a Delhi based NGO, organised a seminar at Hotel Mirage in Sector 70 here. 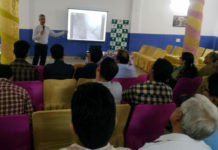 The seminar involved experts and local authorities who deliberated on ill-effects of tobacco and growing consumption in Punjab. Balbir Singh Sidhu, Punjab Labour Minister was the chief guest. Surinder Verma, Chairman, Citizens Awareness Group, while giving the opening remarks said every year this day reminds us of the need to spread awareness on the ill-effects of tobacco. While welcoming the delegates he said, it was indeed a pleasure to have experts and senior government functionaries here to deliberate on the issue. Balbir Singh Sidhu, Animal Husbandry, Dairy Development and Labour Minister while addressing the audience said, NGO have an important role in taking forward such causes and NGOs must go to the rural areas and spread awareness in places where there is zero literacy. He said this section of people need a lot of awareness. Sidhu said while the government is also working towards discouraging the population on tobacco consumption but with NGOs it can be worked out effectively. He said steps are being taken for the new generation, adding that situation in Punjab was much better as compared to other states. The Minister said most patients are reported in the hospitals only after they have been affected with cancer and this is an issue of deep concern. He said Punjab government will extend full support to those working towards curbing the menace. He lauded the efforts made by Citizens Awareness Group and Consumer VOICE in taking up the issue. Dr Ashish Arora, Consultant Internal Medicine, Paras Bliss Hospital, Panchkula said, “Tobacco chewing and smoking is a major modifiable health risk factor. It is responsible for oral diseases including oral and gastrointestinal cancers, precancerous conditions, pulmonary disease, cardiovascular diseases, stroke. Smoking and tobacco use (in other forms) leads to premature deaths because of various diseases caused by its use. Tobacco products contain many harmful chemicals including nicotine, carbon monoxide, tar. Dr. Rajendra P Setty, Senior Consultant Paediatric Gastroenterology, Paras Bliss Hospital, Panchkula said, Tobacco addiction is very difficult to get rid of and is one of the leading cause of death. Smoking can increase the risks of cardiovascular diseases, reproductive problems, dental diseases, cancer in lungs, throat, stomach, mouth and pancreas. Exposure to second hand smoke (passive smoking) is an issue of concern for families of smokers. Addressing the audience Ekta Purohit Manager Projects & CSR for the Voluntary Organisation in Interest of Consumer Education (VOICE) said that the GATS 2017 data shows increasing in tobacco consumption in the state Punjab. About 13.6 percent of men, 0.4 percent of women and 7.3 percent of all adults currently smoke tobacco in Punjab. The prevalence of any tobacco use has increased from11.7 percent in GATS 1-(2010) to 13.4 in GATS 2 in 2017.This indicates need of more stringency of the provisions of the COTPA Act. Rita Bhardwaj, Chief Medical Officer, spoke on the measures being taken to curb the menace and also shared details on cancer cases being reported at government hospitals. She said S.A.S. Nagar has been declared smoke-free and will soon be made tobacco-free. She said this was only possible with support from people and there was a need for awareness as it was indeed a matter of concern that number of deaths due to tobacco consumption is on the rise.